The CIA on Wednesday carried out a major unmanned aircraft attack on a house in northern Pakistan and killed 17 suspected terrorists linked to the Haqqani Network, according to a Pakistani think tank. The drone attack involved four missiles fired into a residence in the town of Miran Shah, located in North Waziristan, Pakistan, about 35 miles south of the Afghan city of Khost, the Islamabad-based FATA Research Center reported. The center stated in a report that the drone launched missiles on a house in the Sarai Darpakhel area of the Miranshah Bazaar around 2 a.m. local time, destroying the residence. Quoting Pakistani officials and locals, the report said 17 militants were killed in the strike. The officials did not identify the dead. One official said the militants hit in the attack were a mixture of local and foreign militants. An eyewitness reported that militants took control of the area and blocked people from reaching the site. According to the center, the area has been a target of past drone attacks. North Waziristan is a major operating region for several terrorist groups active in Pakistan and Afghanistan. They include the Haji Gul Bahadur Group, the Haqqani Network, and Tehreek-e-Taliban Pakistan. "According to intelligence officials, the Haqqani Network members were targeted in this attack, which is considered as a staunch enemy by the western allies in the war against terror," the center's report said. It was the first reported attack in July. Ten terrorists were killed in a June 7 drone strike on a compound in Mangroti, a village of Tehsil Shawal in North Waziristan. Pakistan officially opposes the CIA-U.S. military drone strikes but has allowed them to take place. 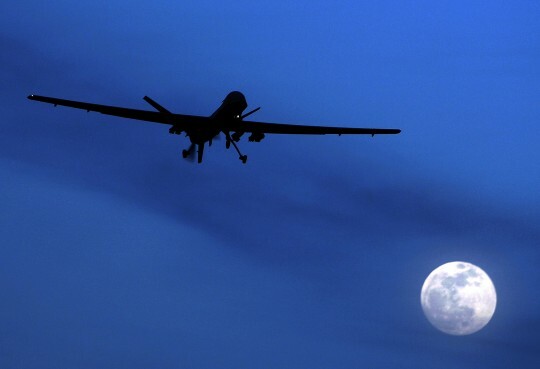 Armed drone attacks by both Predator and Reaper UAVs have become the main feature of the Obama administration’s covert war on al Qaeda in Afghanistan and Pakistan, notably in remote regions of Pakistan where al Qaeda has its main headquarters. Counterterrorism officials have said that as a result of the drone strikes, which have killed scores if not hundreds of terrorists over the past decade, al Qaeda terrorists have moved to other regions, including the Horn of Africa and North Africa where the group is expanding its numbers. Pakistan continues to face Islamist terror attacks, carried out mainly by Sunni groups including the Pakistani Taliban, Sipah-e-Sahaba Pakistan (SSP), and Lashkar-e-Jhangvi (LeJ). Late last month the Pakistani Taliban attempted to bomb a Pakistani judge, Maqbool Baqir, with a remote-controlled bomb. The blast injured the judge and several others, and killed six police officers. Pakistani officials have blamed the domestic terror attacks on covert government support for U.S. drone strikes. However, U.S. officials say the problem of terrorism is an outgrowth of Pakistani ISI intelligence support for extremist groups. The ISI’s Directorate S is known by U.S. intelligence agencies to be the key driver of support for Islamist terror groups in Pakistan as well as Afghanistan. Relations between the CIA and ISI were disrupted following the May 2011 U.S. military raid in Abbatobad, Pakistan, that killed al Qaeda leader Osama bin Laden. But the drone strikes have continued, as shown in Wednesday’s attack. This entry was posted in Issues and tagged Drones, Middle East, Pakistan. Bookmark the permalink.